Who are these people? We've seen the plot theme in numerous movies, a rag tag eclectic highly skilled team is gathered for a mission greater than themselves. Tea Party Express found yours truly three years ago. I was performing at a rally for our troops in Washington DC. 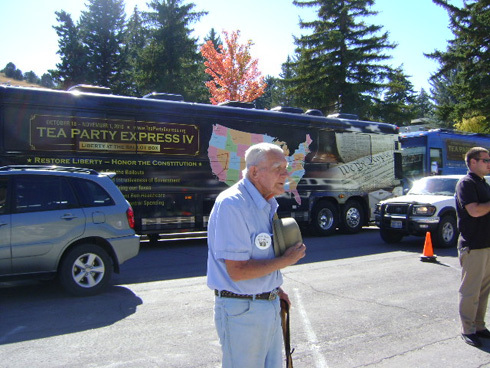 These are just a few members of the Tea Party Express IV "A" Team. Our rallies in every city feature major name guest speakers such as Sarah Palin, Pat Boone and Newt Gingrich along with locals. Our team travels on three buses equipped with bunks, lounge areas, restrooms, kitchens and satellite television. One has worldwide media; Spain, England, Japan, Sweden, Ireland and more. Another bus is for publishers, bloggers and speakers. I'm on the fun bus, the entertainers bus. Movie and recording star Pat Boone spoke and sang at our Los Angeles rally wearing a t-shirt which read, "Beverly Hills Tea Party." How funny is that? Mr Boone also wore his trademark white shoes (white cowboy boots). Our young rapper, Polatik, asked, "Who is Pat Boone?" Lord, do I feel old.